Most Australian Rainforest Wildlife are Nocturnal animals. After dark at Chambers Wildlife Rainforest Lodges the Red-legged Pademelons (Rainforest Kangaroos), Long Nosed Bandicoots and Northern Brown Bandicoots emerge from the forest into the floodlit clearings in front of the lodges. The charming, little Sugar Gliders and powerful White Tailed Uromys turn up to eat the breadcrumbs and honey spread along the trees in the viewing area each night. but you must go spotlighting for them because they won't come down onto the railings to feed. Rainforest Dingoes, Cassowaries and Echidnas (spiny ant eaters). under the fruit trees or along the rainforest pathways. Platypus can be seen early morning and late afternoon in the creek at the bottom of The Chambers rainforest clearing. Spotlighting equipment is available for the guests to view any Australian Nocturnal Rainforest Animals that don't visit the lodge railings. Ringtail Possums and Green Possums. but DO allow at least three days, preferably a week or more, to do it justice. Links To recommended Wildlife Tours/Tour guides. Why are so many animals nocturnal? Why not? As mammals who function by day, we are in the minority. But as a top predator we have little need to hide. Most Australian mammals – as well as insects, small reptiles and frogs – are potential meals for something else so it is to their advantage to function under cover of darkness, when many predatory birds and reptiles are asleep. But where there is potential food, there are potential predators. Although most birds are diurnal, owls feed by night and for pythons, cool night time conditions are ideal for hunting. Nonetheless, night is, on balance, safer for many. From the predators’ point of view, night offers the opportunity to take advantage of food which is unavailable by day – from nocturnal mammals to worms which come to the surface. Competition is also reduced – owls do not have to compete with diurnal birds of prey and frogmouths and nightjars can take the place of swallows, swifts and flycatchers. The nocturnal habits of many mammals possibly date back to when they evolved from reptiles in the time of the dinosaurs. As they were warm-blooded, they were able to function during the night when reptiles – probably their main predators – became inactive. To move more quickly at night, mammals sometimes leave scent trails using special glands, so they can travel along familiar routes with ease. It may not be easy to find animals at night. Signs of their presence however may give good clues as to what is there and what is nearby. Usually in groups, Pademelons browse on the grass in rainforest clearings. Evidence of their presence includes chewed rasp ferns and Smilax vines along tracks. A loud warning thump may be heard as an indication you have startled one. Guests at The Chamber’s can view these animals nightly in the clearing outside the lodges whilst listening to a commentary. The sound of crunching and cracking into hard nuts is likely to be from a White-tailed Rat. It is just as likely to be heard in a tree as on the ground as it is a good climber. Outside The Chamber’s Lodges, the white-tailed rats can be seen as they feed from the railings on a regular basis. Bandicoots dig holes in the ground while searching for invertebrates. The long-nosed bandicoot makes generally deeper and more conical holes than those of the northern brown bandicoot. 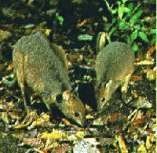 The northern brown bandicoot prefers clearings while the long-nosed bandicoot prefers deeper rainforest and higher areas. A loud rasping call is produced by mist frogs, and a loud clucking call is produced by waterfall frogs. Pond frogs are noisier. The best way to find a frog is for 2 or 3 people with torches to shine them at the spot from which they think it is calling. It is then likely the frog will be near where the beams intersect. The sounds of cicadas, katydids and crickets are commonly heard in the rainforest at night and often easily seen at The Chamber’s. The presence of a Striped Possum may be indicated by gouged logs and a strong musky smell. They dig out wood-boring grubs with their long incisors (similar to actions of the white-tailed rat). A spotlight often shows the glistening of spiders’ eyes. Usually, those active at night are dull coloured, well camouflaged spiders that hide under bark or in burrows during the day. Brown Tree Snakes are nocturnal (unlike green tree snakes). They eat sleeping birds, lizards and frogs, which possibly attract them to the ground level. Luminous Fungi are often seen in the rainforest when the lights are turned off. They may glow to attract gnats that disperse their spores, although no one is certain why they glow. Blinks of light from fireflies are mating beacons as the males and females of these beetles signal to each other. The light given off by the chemical reaction becomes brighter when more oxygen is present. This means flying ones are brighter than stationary ones. Insectivorous bats can be seen darting around creeks and other water bodies. A Leaftail Gecko may be seen, as they prefer to hunt at night unlike most lizards. Torchlight high on a tree trunk may catch the two bright eyes belonging to one of these creatures. A glowing dot beneath a creek or track bank may belong to a glow-worm (the larva of the fungus midge). Look for dangling sticky lines, ready to catch small insects attracted to the light. Fish, eels, yabbies and other creek dwellers are sometimes active at night. To find their way around, fish use lateral lines – fluid-filled tubes under the skin along the side of the body connected to the body via pores. Extensive whiskers of catfish are used to touch and taste too. The loud and mournful calls of Orange-footed Scrubfowls may be heard as they defend their territory from roosts on high branches. Owls, often with silent flights due to the soft fringes on the edges of their feathers causing a break-up of the airflow and muffling of noises, are silent night hunters. They eat rodents, bandicoots, bats, possums, birds, birds, geckos, frogs and invertebrates. The Southern Boobook Owl southern boobook owl often does not fly off when people walk by. Instead, it stands upright, its feathers tightly pressed against its body, and turns side on to the person to give it a very long, slender appearance. southern boobook owl southern boobook owl often does not fly off when people walk by. Instead, it stands upright, its feathers tightly pressed against its body, and turns side on to the person to give it a very long, slender appearance. Rather than rainforests, toads prefer open grassy areas. They have a bright eyeshine and blink often. Splatters of white droppings on the ground may be the indication of a roosting bird above. When it sleeps, it is vulnerable to attack from snakes, so many perch at the ends of thin branches. This gives it a warning, as the weight of an approaching snake will shake the branch. Possums often drop chewed leaves. Herbert River ringtails prefer secondary regrowth and sometimes make their dens in epiphytic ferns. Green ringtails and brushtails feed on secondary and pioneer species, while the lemuroid ringtails prefer the higher canopy level of primary forest. Loud squabbling noises from Flying Foxes may be heard in the rainforest. These bats usually press the fruit against the roof of the mouth to extract the juice and then spit out the remains, which can be found under popular feeding trees. Churned-up earth is an indicator of favourite feeding sites of feral pigs in the rainforest. These animals are potentially dangerous, so be careful. Many nocturnal animals have eyes that are adapted to low light conditions. Because of this, they are easier to find with a spotlight at night. Light passes through the retina when it enters our eyes. Some of this light is absorbed, and some of it is lost in the background tissues. Many nocturnal animals have what is known as a tapetum, which is a mirror-like membrane situated behind the retina, which reflects the light back through the retina again. The light that we see reflected in our spotlights is the remainder of this light that passes out through the eye again. Different animals produce a different brightness and colour of eyeshine. Humans, as seen in flash photographs, have a dull red eyeshine. This is an indication of our poor night vision. In contrast, cats are known to have good night vision as their eyes produce a bright reflection when caught in the headlamps of a car. Possum-spotting experts can often tell which species of possum they are looking at simply by their eyeshine colour. The Herbert River ringtail has a pink or yellow eyeshine, the green ringtail has a dull red, brushtails and striped possums have a pinkish eyeshine, and lemuroid possums have the brightest eyeshine of a white or yellow glare. Tree-kangaroos reflect only a dull red shine, but spiders, geckos and many other nocturnal animals have eyes that glisten or sparkle. Rod cells are the cells that dominate in nocturnal animals’ eyes. They contain a very sensitive chemical called rhodopsin. This breaks down in a process that sets up electrical impulse transmissions to the brain when light reaches it. The rhodopsin is rebuilt instantly using vitamin A as soon as it breaks down so vision can be continuous. Large rod cells contain more rhodopsin, but fewer can be packed into a given area, which means there is a consequent reduction in visual detail. Group size should be no more than 12. Noisy or rowdy behaviour is unnecessary. Use individual torches for safety only. Do not shine spotlights on nesting birds or on any person. Once an animal has been found with a spotlight, the light will usually disturb it, so it is best to quickly cover the light with a filter. Minimise the number of vehicles – no more than 2. When encountering another vehicle, turn off spotlights and torches until well clear. Only use standard vehicle lights to illuminate the road. Connecting a telescope to a TV monitor inside the vehicle reduces disturbance and is useful to less able walkers. Wildlife should not be provoked, fed, handled or interfered with deliberately. Captive wildlife and domestic pets should not be taken on spotlighting tours. Recording any wildlife observations is useful to assess any changes over time and to see the impact of spotlighting upon the resident wildlife population. Nocturnal animals’ eyes are very light sensitive. Using filtered lights of less than 30W will increase both the chance of finding an animal and the length of viewing the animal (they are less likely to move away). Brighter bulbs warn the animals of the approaching people. A filter could be a piece of red cellophane. Tree-kangaroos are very sensitive to light, even with red filters. To keep disturbance at a minimum, it is best to double the filter.